These systems are available in the standard H-01 models and RODI H-40 Models. The RO+DI systems are self contained units, measuring just 20”wide by 20” high by 12” deep. In order to operate, these systems require tap water, a drain, and a grounded 100-240 VAC, 50-60 Hz electrical outlet. These RO+DI systems can be bench, shelf or wall mounted up to 10 feet from the hydrogen generation system. The H-40-C includes built-in reverse osmosis (RO) pretreatment to reduce operating costs by as much as 90%, while allowing the system to run on virtually any quality tap water. 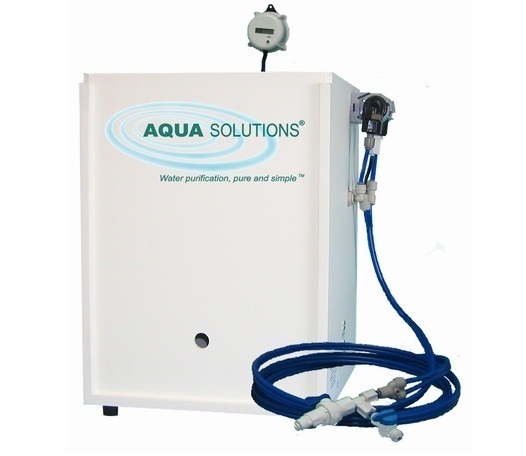 The RO purified water is stored in a 10 Liter pressurized storage tank that sits on top of the system. A purity monitor provides a continuous readout of the purified water quality on its LCD display. The display can be located anywhere within 6’ of the system for user convenience. I would like to request a quote for Hydrogen Generators.